and plans for the future of the garden. light refreshments, an open hearth and you! FREE EVENT! Donations for the garden welcome. 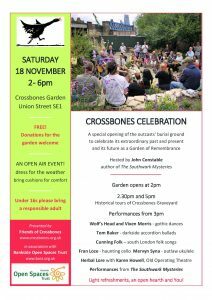 A special opening of Crossbones Garden celebrating its extraordinary past and present, and plans for the future of the garden. 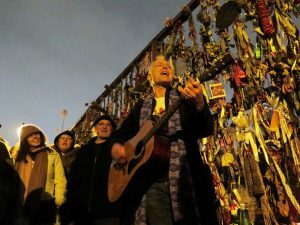 The 162nd consecutive Crossbones Vigil for the outcast, dead and alive. 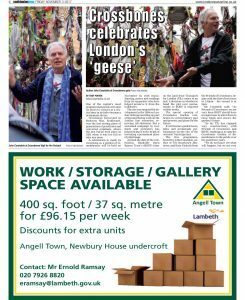 This is also the 21st anniversary of the night The Goose revealed The Southwark Mysteries to John Crow. 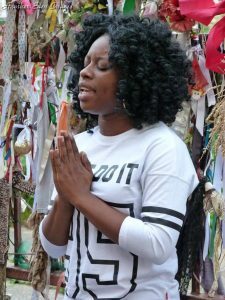 In recent months, many people have come forward to help hold the space and conducts some of the Vigils. This is most welcome as it makes the Vigils more sustainable. 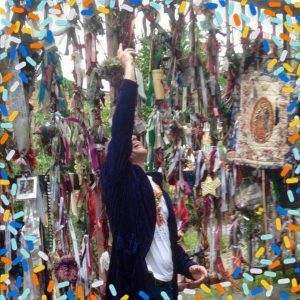 Please bring a ribbon or memento to tie to the gates and thus help renew the shrine. You may also like to bring a poem, song or personal testimony, or anything else that would be good to share. The 161st consecutive vigil held on the 23rd of every month since June 2004. We come here to renew the shrine at Crossbones, the burial ground for Winchester Geese and paupers, to remember the Outcast, Dead AND Alive, and to reclaim the Secret History of The Goose and John Crow. We begin on the stroke of 7. On the 23rd October Vigil, we also mark the portal to Hallowe’en, honouring the Crossbones dead and our own lost loved ones. 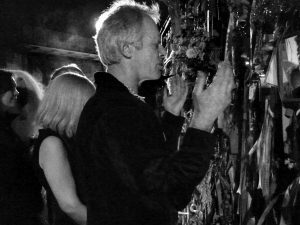 We’ll perform some of the rites created for the now legendary Halloween of Crossbones, including the reading of the names of the dead. You may like to write and bring your own ribbon with the name, date and a few words to remember someone, and other mementos to renew the shrine. Come prepared to co-create! FREE! 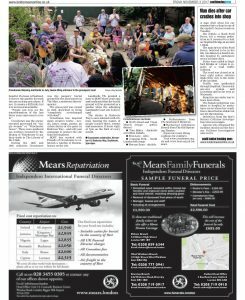 Donations to help cover the costs of the vigil are much appreciated. 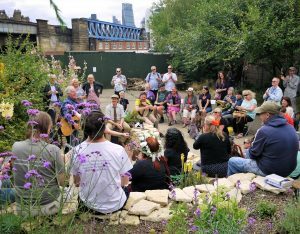 A special opening of Crossbones Garden – with guided tours, talks and promenade performances on the site of the outcasts’ burial ground – celebrating its extraordinary past and present, and plans for the future of the garden. To renew the shrine at Crossbones, the pauper’s burial ground. To remember the Outcast, Dead AND Alive. To reclaim the Secret History of The Goose and John Crow. And to celebrate life itself. Begins on the stroke of 7. This will be the 160th consecutive vigil held on the 23rd of every month since June 2004. 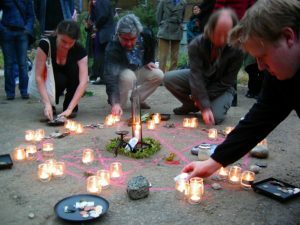 The vigil is structured around simple ritual forms, conducted by yours truly in my John Crow persona, with everyone invited to help hold the space and to play specific roles. On the 23rd September vigil, we also mark the autumn equinox. 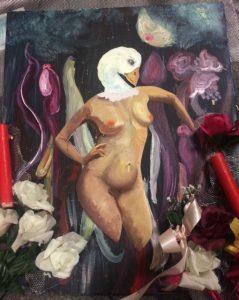 Please bring ribbons or mementos to adorn and renew the shrine, and come prepared to participate and to help with whatever is required to let The Goose take flight! The vigil is FREE! Donations to help cover the costs of organising and presenting the vigil are much appreciated. The Goose is Loose! 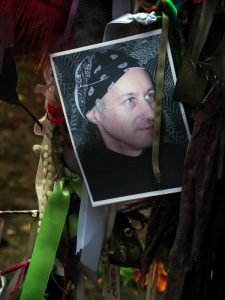 Most of the 158 vigils so far have been conducted by yours truly in my John Crow shaman persona, though Jennifer and other Friends of Crossbones have also done the honours. Your fingers, your thumbs, your ‘Miss You, Mums’. ‘Goose may you never be hungry! Goose may you never be thirsty! – all of which allows us to hold the space for spontaneous offerings of songs, poems and personal testimonies. Whenever I’m around The Liberty, you’ll find me there there doing my thing. When I’m not, others are. Wherever two or three are gathered at the gates, the vigil happens. The pathways are open to walk with The Goose. FREE!